Rev. 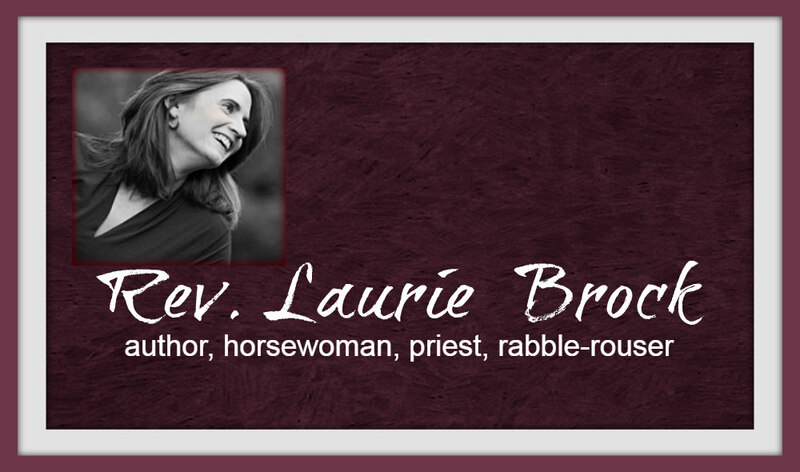 Laurie Brock: So You're Going to Seminary! So You're Going to Seminary! August marks the time when many who felt God's call to Holy Orders and whose call was affirmed by various diocesan and denominational committees arrive at seminary. Many have left family, communities of faith, and familiarity to venture into the unknown. A close friend is making this very journey (yay Matt! ), and months ago, he asked if I had any insight or advice for someone just entering seminary. 1. Thinking you will learn most of what you need to be a priest (or pastor or minister) in your seminary classes is akin to thinking you can learn to ride a horse only by reading books and going to lectures. You can't. Yes, you will learn things that will help your vocation. Knowing theology, scripture, and church history, among other things, is foundational. But at some point, the only way you learn how to be a priest and pastor is to do it...and screw it up in ways at which your ego will shriek in horror. You will also be exactly the priest you need to be at exactly the moment, too. 2. Go to open 12-Step meetings to learn about addiction and to be confronted with your own addiction issues. I cannot quote Richard Rohr enough: we are all addicts; some of us just have socially acceptable addictions. My experience is that most seminary classes have members who are in recovery and will be quite helpful about all that is addiction. Trust me when I say most new clergy (and many older clergy) have no idea how pervasive addiction issues are in congregations. 3. Learn about mental illness. Learn as much as you can about mental illness. If your seminary is on top of things and has classes that offer education in this area, take as many classes as you can. My seminary offered one, and it was almost ignored by seminarians on the ordination tract. I took it and still felt woefully unprepared for working with parishioners who struggle with mental illness and how their illnesses impact a community. 4. Keep the sermons you write and preach in seminary and your first two to three years after ordination. In about a decade after your ordination, take them out and read them. I hope you'll think, "Oh God, I preached this?" It means you've gotten better. That's a key point in this ministry call - to grow and change and become - even after you are ordained. 5. My favorite writer has a quote that goes something like this: "If you run into a jerk during the day, you ran into a jerk. If you're surrounded by jerks, you're the jerk." Basically, you will run into jerks in seminary and you will be the jerk. All those people in your class who annoy you to no end? Yeah, those same personality types will also be clergy in your community. Because, quite honestly, what you hate in them is really what you hate in yourself. Isn't God a stinker for using others to show us the darker, unpleasant parts of ourselves and to help us see the plank in our own eye? 6. None of us were called to ordained ministry because we are awesome. Somehow in God's economy, our wounds and scars are what God sees as valuable. So begin the hard, hard process of tearing down all the false awesomeness and letting your wounds and scars be exposed. A caveat - don't become that person who is only known by his/her wounds and scars. That's just another way of hiding behind false awesomeness. One way to do this (and I say it repeatedly): therapy. 7. Know deep in your bones this vocation will call you to sacrifices you will not want to make. I wish I could give you the, "But Jesus makes it all better," but I can't. In the book When Bad Things Happen to Good People, the writer notes that because of all he went through with his son's illness and death, he knew he was a better rabbi. He also is brutally honest when he admits he'd rather have his son back. Our pain might be redeemed, but even redemption doesn't mean we are glad to have gone through the pain. Every priest I know can tell you personal losses they've experienced, parts of themselves they've had gutted by the church, the way their families have been wounded by their call, and an untold number of moments that left them bloody and broken on the floor of the church. Some find ways to go forward in full-time ordained ministry. Others hear God calling them on a new path. Jesus warns us so many times in the Gospels that this ministry thing is no bed of roses. Believe him. 8. Remember, the clergy collar does not make you a priest. If you aren't enough without the collar, you'll never be enough with it. 9. For the Episcopalians reading this: READ, LEARN, and INWARDLY DIGEST the Book of Common Prayer. Know the rubrics. Believe rubrics are your friend. Read them again and again until you can recite many from memory. Some months ago, when talking with a priest from another diocese, he asked, "Do you use the Nicene Creed every Sunday? I find it takes away from the sermon." I wish, at that moment, I was that priest who carried a flask of bourbon with her at all times. Contrary to my Kentucky reputation, I am not, so I took a deep breath instead and died a bit inside. I cannot stress this enough: bad liturgy is akin to bad pastoral care. 10. Find ways to pray that are not in the acceptable and impressive seminary category of prayer. Experience new ways to pray: go regularly to art museums or concerts, do Tai Chi, paint - use your imagination! The challenge of ordained ministry is that our prayer and worship is also our work. So we need to find other ways to be still and know that God is God. 11. And remember, you will have some of the most challenging and most celebratory moments of your path to ordination with your classmates in seminary. Be present fully. Laugh deeply. Cry honestly. And skip classes every now and then to play. Ummmmm...if the Nicene Creed takes away from the sermon, you haven't got much of a sermon. One more I would add is get a good spiritual director and go on retreats somewhere that offers directed retreats. So much of the work you wrote about needs that kind of quiet and focus. Amen and hosannae, etc. for #8 but I want to underscore the importance of #2 and #3. Note: My comments are grounded in more than two decades of working in and around spiritual/religious communities/organizations. Relative to your point #2 about addiction, I immodestly share this post about how addiction manifests online and how we can use online tools to provide care and support (aka: an intervention): http://bit.ly/15iclmK. Recovery ProTip: don't spend a lot of time searching for "clergy-only" recovery groups where everyone wastes time clinging to being "terminally unique." Relative to your point #3, two words: wounded healer. Of course you must be able to recognize and handle mental illness among parishioners. But add your clergy colleagues, possibly even your bishop..and, oh yeah, you...to that list. Tucked within the herd of elephants crowded into parish meeting rooms is the one that's emotionally disturbed or spewing toxicity because of an undiagnosed character disorder that the other elephants are too nice to mention. Psych Health ProTip: Being invited by your spiritual director to gaze into middle distance and Breathe in the Sacred is no substitute for a rigorous psych eval if you're feeling "nuts" or someone musters the guts to mention that you are. Yes, Laurie. You've got me going on this fine Saturday morning! See note above. I'm a lay person who has worked in the church for the better part of 20 years. This is a GREAT post which I would like to re-post on my blog (GOTAPconsulting.com) which should go live in a couple of weeks. Thank you for the sound advice that, sadly, is not taught in seminaries. After 57 year in priesthood , I want to say plainly that YOU will do nothing—whatever of value is done is done by God. YOU can't save an ailing parish—God can! YOU can't comfort the torn and battered—God can. YOU can'r preach inspiring sermons—God can. The key is simply to lose yourself inside of God—listen to these eucharistic words:"IN(SIDE) HIM you have delivered us from evil, and made us worthy to stand before you. IN(SIDE) HIM you have brought us out of error into truth, out of sin into righteousness, out of death into life." And spend at least a third of your time in silent, wordless, accessible and utterly vulnerable prayer.To paraphrase: "Seek God first, and everything else will be taken care of." But if your priesthood does not cost you something—emotionally, mentally, physically, socially, career-wise, financially—then you'll be another time-server like the rest, walking the easy and well-trodden paths, accepting the unearned perks that come with the collar, living the upper-middle class way, and probably ending up a bishop. Thank you for a very good set of comment about entering seminary. The one about the Prayer Book is one that reminds me of my very first "militantly low church" bishop. If you didn't know the Prayer Book, rubrics and all, you were going to be in deep trouble. Alas, I keep running (in my retirement after 37 years active and 25 years interim/supply ministry who treat rubrics as "pick and choose" elements of the book. Their efforts at worship simply lack authority. It fails to offer a true "full package" that the Prayer Book envisions. It was just as true with the 1928 book, though the rubrics in those days SEEMED to be better observed. 25 years into ordained ministry I echo the need for self awareness and an acknowledgement of our wounds 1000%. I would add that an understanding of your true gifts is also helpful. BCP) is a little narrow for good liturgical practice. As with pastoral care, it is good to learn standard theory and practice, but then to know how to use that knowledge in diverse situations. I'm reminded of the joke. What's the difference between a terrorist and a liturgist? Answer : you can negotiate with a terrorist. Laurie, Thanks! I'm on a diocesan COM and I will save this to pass along to those who go to seminary from our diocese. 1) "Take all the liturgical studies you can get." 2) "Take any courses on liturgical music." 3) "Also, get what training you can in counseling...enough so you will know how to listen and counsel wisely...and when you should refer..."
His best advice: "hold them tightly with an open hand." Five years into ordained ministry, I find myself wishing I could go back and do seminary differently. I was so consumed by the struggles in my personal life I feel like I missed out on a lot of content. But I've come to think recently that the fight within my own heart that took everything I had to survive, was probably more formative in the end than had I had better notes or exam scores. Seminary will form you, one way or another, but some of the most important formation may not come in class. Thank you so much for this post, Laurie, and thanks to everyone else for all of the comments. I'm only just at the beginning of the "official" path to ministry, and seminary is still a year or two in the future for me, but for now it's such a blessing to find honest wisdom like this. Thank you for it, and for its truth.